..... Click the link for more information. , lies in Sagittarius. The constellation reaches its highest point in the evening sky in August. (saj-ă-tair -ee-ŭs) (Archer) A large zodiac constellation in the southern hemisphere near Scorpius, lying partly in the Milky Way. The brightest stars are the 1.8-magnitude Kaus Australis (∊) and 2.0-magnitude Nunki (σ) with several others of 2nd and 3rd magnitude. The center of the Galaxy lies in the direction of Sagittarius. Although this region is obscured at optical wavelengths by considerable dark nebulosity, observations at other wavelengths have revealed very complex phenomena (see galactic center; Sagittarius A). The constellation contains star clouds, many nebulae, including the Omega, Lagoon, and Trifid nebulae, many globular clusters, including the bright ones M22 (NGC 6656) and M55 (NGC 6809), and some open clusters, including M25 (IC 4725). Abbrev. : Sgr; genitive form: Sagittarii; approx. position: RA l9h, dec –30°; area: 867 sq deg. The constellation Sagittarius in a late 18th-century engraving by Montignot. Reproduced by permission of Fortean Picture Library. Unlike many other members of the zodiac, Sagittarius has a complex mythology. Symbolically half human and half animal, the alternative mythical figures for this sign also tend to place Sagittarius between the poles of animal brutality and high refinement. Chiron, the son of Philyra and Chronos, was a highly learned and refined centaur. A wise teacher who tutored Aesculapius, Jason, Achilles, and Hercules, Chiron’s vast knowledge encompassed hunting, ethics, music, medicine, and the martial arts. Wounded by a poison arrow, he was unable to heal himself. He gave his immortality to Prometheus so that he could die and put an end to his own misery. Out of pity, Zeus is said to have transformed Chiron into a constellation. 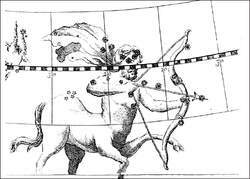 The figure of the kindly Chiron, however, is somewhat at odds with the image in the constellation Sagittarius, which points its drawn bow menacingly at Scorpio. Thus, an alternative image for Sagittarius is as an average, nondivine centaur with all the impulsive, savage brutality normally attributed to this mythical species. Like the worst centaurs, Sagittarians can be crude, wild wanderers, always seeking adventure and freedom from all restraint. They can be reckless, irresponsible, and excessively blunt. Positively, natives of the sign are humorous, entertaining, and optimistic. Like Chiron, they prize wisdom and make inspiring teachers. All Sagittarians strive upward. For the less evolved, this may mean social climbing; for the more evolved, a striving toward higher wisdom and spiritual insight. Like all fire signs, they are fond of physical and social activity. An incurable optimist, you have big dreams, aspirations, and hopes for the future and are usually pursuing some distant goal. You have a great deal of faith and trust in life and failures don’t crush your spirit. You always bounce back from disappointments, often with another bright dream or scheme. You have a sporting, playful attitude toward life and are philosophical about your mistakes. You have the ability to sense future trends, to see the big picture, and you like to theorize and speculate. However, attending to all of the details and practical requirements of implementing your theories is bothersome to you. You express yourself in a very open, direct, and straightforward manner and are often blunt and tactless as well. Because you do not take yourself too seriously, you may not realize how deeply your candid statements can wound more sensitive souls. In fact, though you may not realize it, your insensitivity and lack of understanding regarding others’ feelings is probably one of your worst faults. To the medieval astrologer, there were three kinds of Sagittarian: the gypsy, the scholar, and the philosopher. They’re all legitimate, healthy parts of the picture. Sagittarius represents the urge to expand our horizons, to break up the routines that imprison us. One way to do that is to escape the bonds of the culture into which we were born—that’s the gypsy. Another is to educate ourselves, to push our intelligence beyond its customary “position papers”—the way of the scholar. Finally, our intuition can stretch outward, trying to come to terms with cosmic law, attempting to grasp the meaning and purpose of life. That’s the philosopher’s path. To keep your Sagittarian energies healthy, you need to feed them an endless supply of fresh experience. Travel. Take classes. Learn to scuba dive. Amazement feeds the Archer the same way protein feeds your physical body. Conversely, if there’s a cardinal sin for Sagittarius, it is to consciously, willingly allow yourself to be bored. The expansion of the ego to the uttermost bounds of human thought, experience and knowledge motivates the Sagittarian, who rushes out eagerly to greet life, equipped with a radiant nature, abundant vitality and a keen, alert mind eager for the fellowship of earth and willing to extend his knowledge to last limits of heaven. The approach to life is straightforward, for the aim is not subtle: it is to experience, to know, to try, to adventure. As a result, the Sagittarian goes far, literally and figuratively. He travels, either geographically or in thought, or both; and however he travels he likes to go fast. If he finishes things at all, it is because he is quick, not patient; life is too short for him to bother with details, and he feels that he will learn more, see more, know more if he goes more. He can thus be superficial, but is rarely shallow, for his sincerity goes right down into his marrow, and a platitude on his lips can become a great truth because of the wholeheartedness with which he believes it. With your Sun in Sagittarius you are a woman who thrives on the grand adventure of life. You may feed this urge through travel or education, but you also fulfill it through your spiritual quests. Your enthusiasm is difficult to miss, and you can inspire others to reach beyond their limitations through the example of your own life. But you can also be difficult to follow, and may head into a new territory before you’ve even warmed your chair. Since you’ve always wondered about everything, a certain level of personal assertiveness has always been part of your personality. Your Sagittarius Sun energy is a powerful driver, stimulating your sense of adventure and endless questioning and giving you an air of excitement. You’re the woman who has been comfortable venturing out on your own, particularly if you have a strong interest driving you. As a young girl your experience of your father may have been especially connected to his interest in learning or his philosophical or religious teachings may have been a stronghold in your life. But you may also have a desire to develop these elements of your life in your own way, and in searching for the truth of yourself are likely to discover some differences from your upbringing. Developing your individual identity may be easier said than done because you may always have a tendency toward extreme reverence for your teachers and may take the teachings too literally. Task one: separating the teacher from the teaching will allow you to gain confidence in your individual ability to develop a connection to divine truth. Then, as you explore the vast nature of spirituality, you may discover a path which is uniquely your own. This in turn influences your sense of who you are, not just as a woman, but as a human being on a quest for the ultimate. You have quick apprehensions, but you are changeable in your opinions. You are fearless, good-natured, high-minded, crafty and ingenious, proud, quick to anger, but soon you are over it. You are stouthearted, valiant, and witty. You aim at great things, but you can be too severe in the exercise of power. This does not prevent you from achieving success. You are a Fire Sign, which means that you are “hot” and “dry.” The “dry” component means, among other things, that you see distinctions easily, and that you are more swayed by intellectual argument than by passion. Being “hot,” you react to things quickly: by expressing your anger strongly and immediately, you don’t tend to harbor a grudge. You may be perceived by others as angry, but that’s only if they are not “hot” as well. You will be perceived as having high energy levels, and yet you are aware of a curious stillness amidst the seeming activity. You may need more sleep than colder types in order to recharge your batteries. You are mutable, which means that you adapt easily to change. However, you adapt so easily compared to others that they may wonder if you are capable of maintaining a permanent stance about anything. A constellation whose major portion lies in the Milky Way; right ascension 19 hours, declination 25° south. Also known as Archer. Caption: The Moon pays a visit to Sagittarius, the Hyades, Cancer, Leo, and Libra this month. With Mars moving into Sagittarius, there should be a brief flurry of excitement. For weekly readings call 0903 658 2003 (75p/min + access charge) ARIES MARCH 21 - APRIL 20 With Mars your ruler in Sagittarius, you won't think twice about suddenly leaving. For weekly readings call 09036 5820 11 (75p/min + access charge) SAGITTARIUS NOVEMBER 23 - DECEMBER 21 Mars enters Sagittarius and you won't be slow to respond. For weekly readings call 0903 658 2011 (75p/min + access charge) SAGITTARIUS NOVEMBER 23 - DECEMBER 21 , 2009 Mars enters Sagittarius and you won't be slow to respond. Indeed, the New Moon in Sagittarius suggests that you could be richly rewarded today, though you may someone you badly need. CALL FOR MORE 0903 658 2010 (75p/min + access charge) SCORPIO OCTOBER 24 - NOVEMBER 22 The Sun linking up with Mercury in Sagittarius simply means there is no such thing as a free lunch. That means you would need more than one trillion Earths if Sagittarius A* was the object on the scale's other hand. The influence of Saturn currently in Sagittarius suggests that one relationship may become very intense. Anyway, a brilliant Full Moon in Sagittarius suggests that you're about to find out who your real friends are. This arm runs parallel to the Perseus (black) and Sagittarius (magenta) arms.